PROBLEM: Evidence-based practice has helped fields like medicine, education and criminal justice. But communications practitioners typically evolve their approaches through trial and error, relying on gut instincts and who still has a job when the dust settles. Failure to “connect the dots” and find common dynamics across many situations and stakeholder concerns can lead to misaligned messages and lost credibility. SOLUTION: The Sheehe Group and it’s GMU-affiliated StratComm360 project (formerly pio360) changes this, with communications insights backed by both real-world expertise and deeper research understandings into how people think, behave and respond to messages in crisis and non-crisis situations alike. The Communications Ecosystem is our evidence-based methodology that any practitioner can leverage in vetting issues, concerns and engagement strategies. It’s an accessible framework to help align messages and master most any engagement format – from media interviews and public meetings, to real-time interactions with internal audiences, lawmakers, regulators, peer groups and key influencers. 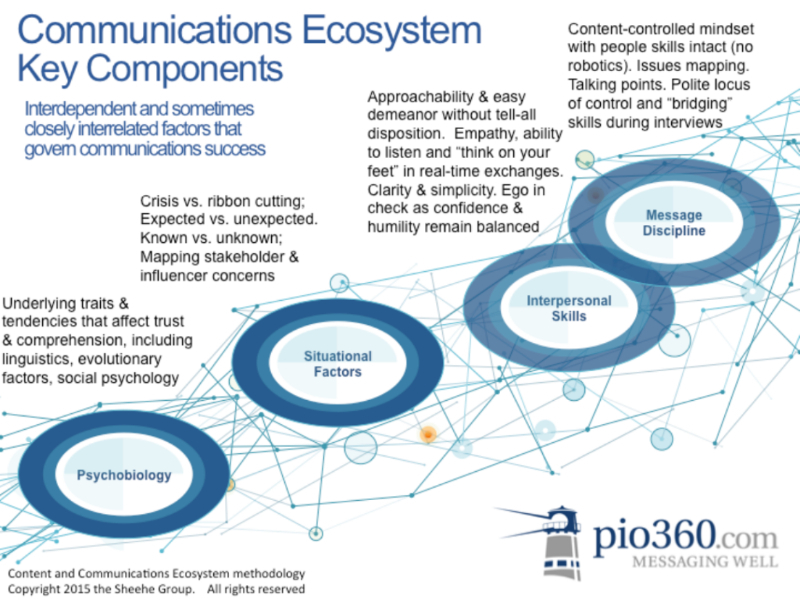 StratComm360 and the Communications Ecosystem was developed by Richard Sheehe, a former NBC national news correspondent and anchor who is now Senior Research Fellow at George Mason University’s Department of Communication. He has also been a curriculum adviser and instructor for the CDC’s Crisis and Emergency Risk Communication (CERC) program since 2003, and he co-authored an HHS media guide on public health communication. Richard previously served as a spokesperson and Assistant Vice President for George Washington University, and he’s worked on communications and strategic messaging projects for Tulane University, University of Washington, University of New Hampshire, University of Virginia, University of Maryland, Drexel University and other institutions. He has conducted workshops around the country for numerous groups, including the National Institutes of Health, the U.S. Department of Homeland Security, the U.S. Department of Agriculture, the National Transportation Safety Board and the National Foundation for Infectious Diseases. Richard also led a multi-year, NIH-funded Regional Centers of Excellence program of in-person and online media trainings for bioscientists who handle anthrax and other serious pathogens.